This portion of my garage had not been finished when I built our home in 1993. In order to insulate the attic over the garage, I had to install proper vents, or air chutes, and insulation dams. First, I removed the soffit panels from outside. Then I stapled up air chutes, full with. Then I compass cut short pieces of rigid foam to closely fit the contours of the proper vents. I caulked these to the wall sheathing and foam sealed the gaps. Later, I will continue stapling up the air chutes from inside the attic and will air seal the joint between the wall and the ceiling rock. My new insulation dam is also an air dam. I used left over rigid insulation because it is easy to cut with my Leatherman and it is easy to handle and shape. The bottom edge is caulked to the osb wall sheathing. The joints between the dam and the framing and roof deck are sealed with low expanding foam. My intent is to block all potential air flow from the ceiling surface and to direct it up into the attic itself, where it will be drawn out by the ridge vents. Much later, when I am working on the inside of the attic, I will seal any air leaks I can see as I seal the nearby wall plates. I had prided myself on the joy I get from insulating and my ability. If you look at the left side of the air chute, you see a gap in the insulation. This gap is over the wall plate. Now, I have two wall plates, so it is not as critical as if I had only one, but it is still a reduction in insulation, left behind by the proud insulator. Also, I suppose to save money, I cut the proper vents in half. Proper vents are very cheap. I reduced the air flow by half in each truss cavity. When I added these in to the new garage, I used full width air vents for maximum air flow above the insulation dam as seen in photo 5. My "Insulation Dam". The once bright yellow insulation is now a dull yellow gray/brown. It has been acting as a 'furnace filter' for 15 years, catching the dusts that have been blowing up through the soffits and into my attic. 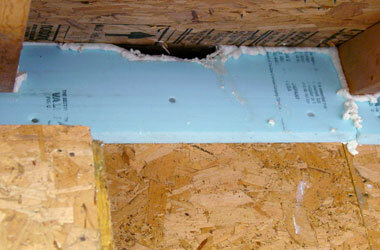 When air blows through fiberglass, the fiberglass loses its R-Value. 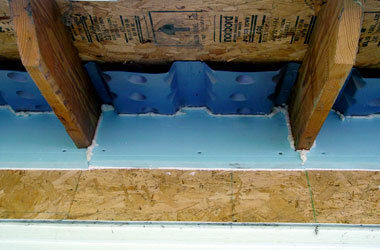 Fiberglass has to be contained on all sides to be effective insulation. 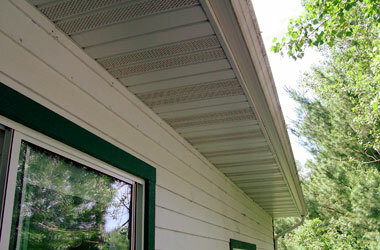 The West Soffit of my home, before, and after actually. The west side of my home is protected by a hill and trees. We get more of our direct sun light in the east and west windows as the sun is more direct when it is low. The tall poplars and the hill and the trees beyond pretty well shade the west side in the afternoon. In October 2015 the home of Charles and Wimmer was struck by lightning and severely damaged. Charles and his wife decided that they wanted to have the house restored to it original design but add several energy efficient updates. First the roof was hand framed with 2X10s , shingled and a rubber roof added to the 8 X 12 flat area at the top. 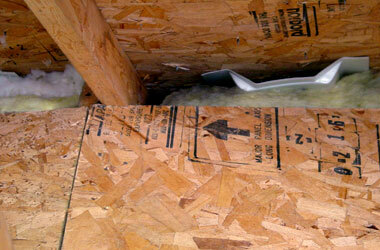 The bottom side of the rafters was covered with a reinforced poly that was stapled snugly to the rafters. This are was then dense packed to a R- value. 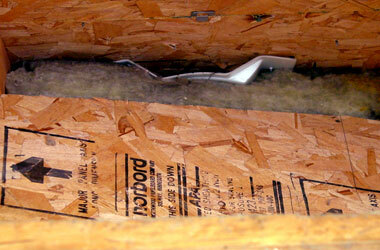 The dense packing not only insulated but also stop any air flow out of the attic area. In 2008, I decided to have an energy audit done. Focus on Energy hooked me up with Aaron Riendau, of St. Croix Energy Consultants. He came and we pressurized the house with his blower door unit. He tested our air exhaust appliances and the drafts on the furnace and water heater. With all the doors closed, we looked all around the inside of the house with his infrared camera. When we put the house under pressure, we are able to induce drafts into the house from the outside. When the outside air is either much cooler or warmer than inside, we are able to see through where the outside air is coming in. I was shocked to see incredible leaks along the tops of my finished walls, around window frames, even around electrical outlets on interior walls. I had thought that I had done a perfect job of sealing up the thermal envelope. I would have been happy with a .5 ach but my home tested about 2.5 ach. I knew from training that the leakier the home, the more expensive to heat and to cool. On wind days, I was losing lots of energy due to leaks. The air tests also revealed in part why my upper floor gets so warm in the summer and stays so cool in the winter. The dormer lets loads of air in and the backs of my finished walls are awash in flowing, heat robbing air. As my home needed repainting I decided to address as many of the known air leaks as I could. This section of my website is devoted to this project. In pictures and words, I will be documenting the air sealing techniques I am using to achieve a lower air exchange rate. When I have all the work on the outside and in the attic completed, we will retest to see how well my efforts worked. Then, we will tackle the electrical penetrations and other mechanical openings in the house, and all the weather strips on doors that are shrinking. And we will test again. I will track my costs in time and material And will post monthly changes in gas and electricity use over the next several heating seasons. 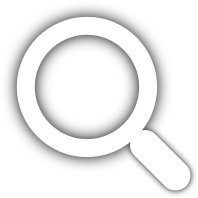 We will assess the change in comfort throughout the our home too. This is the initial energy audit on my home with project photos below. Three miles west of Menomonie off of Hwy 29. North on 370th St.